I met up with Esther in the lobby of the hotel, as Congress attendees checked in, hugged old friends, and matched faces to Skype calls. 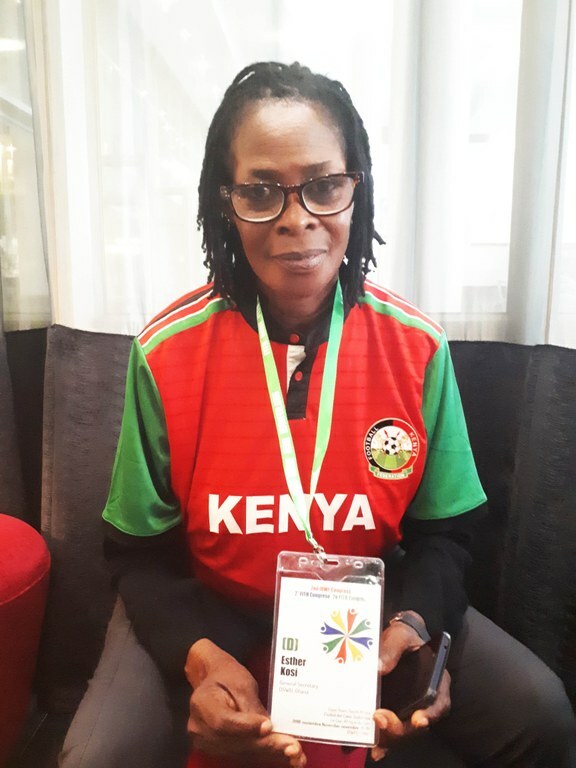 I initially thought she was a delegate from Kenya, as she wore a Kenyan football jersey. She laughed and pointed out that it even had her name on the back, as a friend from Kenya had made it for her. It is the first of many swaps and shares that will happen in Cape Town this week, as domestic workers unite at Congress. How did you learn about the movement for domestic workers’ rights? I took Labour Studies at College, and I specialized my project work on domestic workers. Because I am a trade unionist. I was organizing for the trade union. I have been in the Ghana Actors’ Guild since I was young. I was 15 when I started domestic work and I worked in costuming in the movie industry. I cleaned costumes and looked after the special clothing. The guild is an affiliate of the trade union in Ghana. An opportunity came for me to study at Labour College, and I did that. I organized waste pickers, domestic workers. I organized a street protest for the kayayei, the head porters. I've been doing this since 2008. I was a local union secretary for the taxi drivers. I am in contact with them. I give them customers and jobs to do, and build a relationship with the drivers everywhere. When the convention 189 was adopted by the ILO in 2011, the trade union sent me around to organize domestic workers for programs through WIEGO. What was it like to organize domestic workers? `I am still a domestic worker. Now I work in homes, but many of my employers are actors that I worked for earlier. I got into domestic workers issues because the message was going round that domestic work is decent work. These were domestic workers in the homes I knew -- drivers, cooks, gardeners, laundry, people who look after pets. And the word was going around that domestic workers should have rights. Domestic work is decent work. Challenging. If you have little education, trying to convince you is difficult. We would announce for people to meet, but it was challenging to explain. When I am speaking they don't always understand what the message is. That it is important to stop people from cheating you, and from looking down at you. But when they get it and understand, it's exciting. When you are organizing, what do you want the workers to know? First thing is that when you join the union, you have a strong voice. In Ghana you are free to join a union. We have freedom of association. But employers do try to stop them. I saw employers who suppress the employees. Forced to go to sleep at 8 o'clock -- you don't even have the choice to choose when you sleep. Forced to go to their employer’s church. A young woman who was a Catholic was forced to go to a Hindu temple. She wasn't allowed to practice her own religion. The employer wasn't paying her a regular wage – there was no contract, so pay was negotiable. The young woman didn't always get to eat all of her meals. I contacted Adjoa Sakyi for advice and she said I should go back and sit down with the employer. So I went back with Convention 189 and I started talking. I said that if something happened to the girl, she would be arrested. The girl had rights too. She needed to build a relationship so that the employee would be happy in the home. The employer said the girl was poor and vulnerable in the village and so they were helping by bringing her to the city. I told her, ”if you brought her from the village, you have to pay her.” And I told the employer that she was allowed to go to the church of her choosing. How did the employer react? She said that she would contact the girl’s mother in the village and ask what she had to pay. But, she didn't call the mother. So, I called the mother. Now, the girl has left. I found her a place to go and live. She has signed a contract so she knows what money she will be given is, and she is happy. She gets salary every 2 weeks and she likes it like that. In Ghana they are not paid minimum wage, but it is negotiable. The employer didn’t ask the girl what she wanted. What would happen if the girl didn't have a mother? She would be working for free. From your experience, what are the biggest challenges for domestic workers? First, they don't know their rights. The ignorance of rights. They should have better conditions of employment. They deserve employment that respects occupational health and safety. They should not work in hazardous conditions. Second, we need to build alliances with agencies and everyone involved so we can create big awareness everywhere. We find it difficult to organize because funds are limited. If domestic workers had equal rights to other workers, what would you say is a good thing about being a domestic worker? You have passion for the work you do. When you are washing, you start to sing if there is happiness in the home. When you cook, you sing. It is wonderful. I love my job. People think it is a vulnerable job, but it is not. I love it. I have worked for my employer for a long time and we have a good relationship. She gave me something small for the travel here. We have a good relationship. If she calls me and asks me to do something for her, I go and do it. Sometimes I go and wash for people because I love it. I am proud of what I am able to do.